Hip-Hop singer/producer Timbaland wed his girlfriend of two years, Monique Idlett, in a ceremony on a private island in Aruba yesterday, reports Us magazine. The couple had an informal wedding in Virginia last month... in their sweats! The island ceremony hosted 300 guests, including hip-hop heavy-hitters Missy Elliott, Omarion, rapper Magoo, and Interscope/Geffen Chairman Jimmy Iovine. The Miami-based newlyweds welcomed a baby girl in November, who was carried down the aisle by longtime friend Fredrick Fraser, VP of Mosely Music. 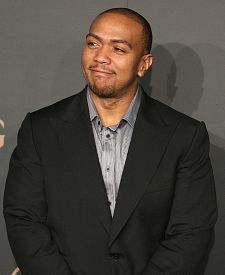 Timbaland has two sons, Demetrius and Frankie, from a previous relationship. This is the first marriage for both.